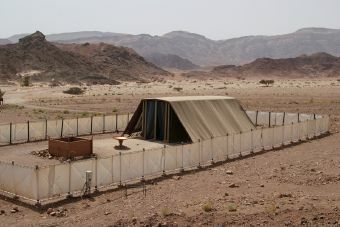 The Tabernacle, with its inner tent, outer courtyard, and sacrificial altar (the biblical description has the menorah inside the tent rather than in the courtyard). 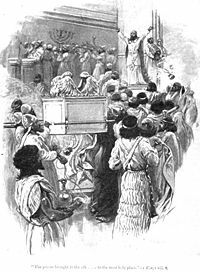 The Tabernacle, in the Bible, was a portable central place of worship for the Israelites following the Exodus during their period of wandering in the wilderness. It was established at Shiloh during most of the period of judges, and its core elements were made part of the Temple in Jerusalem about the tenth century B.C.E.. It is known in Hebrew as the Mishkan ( משכן "Place of [Divine] dwelling"). The Israelite tribes camped around the Tabernacle in the wilderness, and the presence of God was said to appear visibly over its inner sanctuary in the form of a cloud by day and fire by night. Moses sometimes spoke to God "face to face" in this sanctuary, also called the Tent of Meeting. Aaron and his sons ministered inside the Tabernacle, offering burnt sacrifices outside the Tent of Meeting and attending a golden incense altar in the inner sanctuary. The sacred Ark of the Covenant was also kept in the Tabernacle, in the "Holy of Holies." Levites assisted the Aaronic priests in attending the Tabernacle and also dismantled and carted the structure to its new location whenever the Israelites moved on from their encampment. At Shiloh, the Tabernacle took on a more permanent character until its sacred furnishings were incorporated into the Temple of Jerusalem. Biblical critics believe the above description of the Tabernacle is something of an anachronism, since so large and ornate a structure would be unlikely in the time described. Instead, they suppose that a portable sacred tent may once have existed in the Hebrew past, but that the glorious Tabernacle as detailed in the Book of Exodus is probably a reflection of the Temple of Jerusalem, projected backward into Israel's mythic history. The English word "tabernacle" is derived from the Latin word tabernaculum meaning "tent, hut, booth." Synagogues and churches are often designed in a way that echoes the Tabernacle's inner sanctum, and Christianity—in the Book of Hebrews—sees the Tabernacle with its priests offering sacrifices as foreshadowing heaven and Jesus' self-sacrifice on the Cross. Some Christians see the Tabernacle as representing the Messiah himself. The Hebrew word for "tabernacle" is "mishkan" which means "Place of [Divine] dwelling"
The Hebrew word mishkan is related to the word to "dwell," "rest," or "to live in." The Bible describes God as physically descending in a cloud over the Tabernacle to speak with Moses or otherwise be present to the Israelites. The word mishkan is also related to the presence of God as the Shekhina—a feminine term—which rested within this divinely ordained structure and is also present to pious individual Jews wherever they may be. Commentators differ on the exact appearance of the Tabernacle, but its general description is as follows: Its courtyard was enclosed by an external perimeter comprised of a rectangular fabric fence, poles, and staked cords. Its dimensions were 100 cubits long by 50 cubits wide, a cubit being approximately 20 inches. In the center of its enclosure was a rectangular sanctuary, also called the Tent of Meeting, which was draped with goats'-hair curtains and had a roof made from rams' skins. Outside the Tent of Meeting stood a sizable altar for burnt offerings and grain offerings, at which the Aaronic priests ministered. This altar served a central function in Israelite sacrificial tradition as outlined in detail in the Torah. Five types of offerings were made at the Tabernacle: burnt offerings, grain offerings, peace/fellowship offerings, sin offerings, and trespass/guilt offerings. Only priests descended from Aaron, assisted by their Levite cousins, were allowed to attend the altar. Other Israelites were forbidden to enter inside the Tabernacle perimeter, on pain of death (Numbers 1:51). Sometimes the entire Tabernacle was referred to as the Tent of Meeting, as was an earlier tent used by Moses to commune with God before the Tabernacle was constructed. The inner sanctuary was divided into two areas, the Holy Place and the Most Holy Place, or "Holy of Holies." These two compartments were separated by a curtain, or veil. 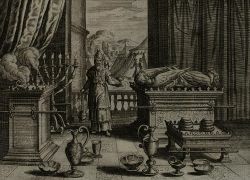 Entering the first space, one would see three pieces of sacred furniture: a seven-branched oil lampstand (menorah) on the left (south), a table for 12 loaves of showbread on the right (north), and straight ahead before the dividing curtain (west) was a golden altar for incense-burning. Twice a day a priest would stand in front of this altar and offer fragrant incense. Beyond this curtain was the cube-shaped inner room, the Holy of Holies (kodesh hakodashim). This sacred space originally contained a single article, the Ark of the covenant. However, other items were added later, including a vessel containing manna and Aaron's rod, which had miraculously budded as a sign of his divine priesthood. The entire Tabernacle complex was carried by the Levites and erected whenever the Israelites camped, oriented to the east. Chapter 25: materials needed, the Ark, the table for showbread, the menorah. Chapter 26: the Tabernacle, its beams, and partitions. Chapter 27: the bronze altar for burnt offerings, the Tabernacle enclosure, and holy oil. Chapter 28: vestments for the priests, the ephod garment, ring settings, Aaron's breastplate, robe, head-plate, tunic, turban, sashes, pants. Chapter 29: the procedure for the consecration of priests and the altar. Chapter 30: the incense altar, washstand, anointing oil, incense. After the incident of the Golden Calf, however, the Tabernacle remained unbuilt. Instead, Moses used a simple "tent of meeting" in which he spoke "face to face" with God (Ex. 33:7-11). Moses then interceded for the people and spent an additional 40 days fasting on the mountain. After he descended from the mountain, Moses collected the congregation, impressed upon them the crucial importance of keeping the commandments, and requested rich gifts for the Tabernacle sanctuary. The people respond willingly, and the master craftsmen Bezaleel and Aholiab completed the instructions for making the Tabernacle and its contents, including the sacred Ark of the Covenant. Far from being a mere tent which housed the Ark, the Tabernacle is described as an ornate structure with secure but portable foundations of pure silver, collected from the required half-shekel offerings of 603,000 Israelite men. "If the cloud did not lift, they did not set out until the day it lifted. So the cloud of the Lord was over the Tabernacle by day, and fire was in the cloud by night, in the sight of all the house of Israel during all their travels." After the Israelites entered Canaan, the Tabernacle was established semi-permanently at Shiloh (Joshua 18:1). There, the Israelites cast lots to determine the distribution of land among the tribes (Joshua 19:51). Soon a dispute about centrality of the Tabernacle arose between the Israelites who had settled in Canaan proper and those—the people of Gilead, Reuben, Gad, part of the tribe of Manasseh—who had settled east of the Jordan River. Aaron's grandson Phinehas and elders of the western tribes confronted these eastern settlers, demanding: "How could you turn away from the Lord and build yourselves an altar in rebellion against him now?" (Josh 22:17). A compromise was reportedly reached in which the eastern tribes agreed not to use the altar for sacrifices, and the western delegates allowed the altar to stand as a "a witness between us and you and the generations that follow, that we will worship the Lord." The Ark and other contents of the Tabernacle are brought to their new home in the Temple of Jerusalem. Shiloh became a place of pilgrimage for Israelites who wished to offer their tithes and sacrifices there. However, local altars were also allowed at such sacred sites such as the high places of Gilgal, Bethel, Ramtha, Mizpah, and—according to Samaritan tradition—Mount Gerizim. It was to Eli the priest of Shiloh that Hanna, the prophet Samuel's mother, came to pray for the birth of her holy son. However, the Tabernacle soon became a place of infamy when Eli's own sons abused their positions to commit fornication with women who served at the Tabernacle's entrance (1 Samuel 2:22). The Ark itself would soon be captured by the Philistines (1 Samuel 4). Later, when King David conquered Jerusalem, he transfered the recaptured Ark of the Covenant to a tent-shrine in his new capital (2 Samuel 6). When Solomon built the Temple of Jerusalem, the other main elements of the Tabernacle were incorporated into the newly built permanent temple. In the biblical narrative, the Temple of Jerusalem replaced the role of the Tabernacle as the central dwelling place of God. Nevertheless, the prophet Ahijah of Shiloh would soon appoint Jeroboam I to oppose Solomon's son Rehoboam as king of the northern Kingdom of Israel. Ahijah would soon turn against Jeroboam, however, when he bypassed Shiloh to establish nearby Bethel as a national shrine for his new administration. The Tabernacle served as the pattern, or blueprint, for several later traditions. The Temple of Jerusalem itself is the clearest of these. Like the Tabernacle, it consisted of a large outer courtyard in which priests offered sacrifices and a sacred inner building in which God Himself was thought to dwell. 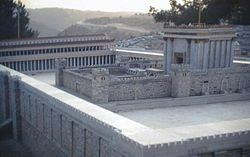 The inner temple too was patterned after the Tabernacle's pattern, with its Holy Place, where incense was offered, and its Holy of Holies, where the Ark of the Covenant and other sacred articles were kept. There, Yahweh was enthroned on the mercy seat formed by two golden cherubim atop the Ark. The tabernacle also formed the pattern for synagogue construction over the last 2,000 years. 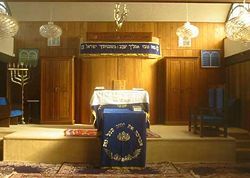 Synagogues typically center on an "ark" area at their front containing the Torah scrolls, comparable to the Ark of the Covenant which contained the tablets with Ten Commandments. This is the holiest spot in a synagogue, analogous to the Holy of Holies. There is also usually a constantly lighted lamp, or a candelabrum lighted during services, near this spot similar to the original Menorah. At the center of the synagogue is a large elevated area, known as the bimah where the Torah is read. This high place is equivalent to the Tabernacle's altars upon which incense and animal sacrifices were once offered. In some Orthodox synagogues, on the main holidays the priests, kohanim, gather at the front of the synagogue to bless the congregation as did their priestly ancestors in the Tabernacle from Aaron onwards. Within Catholicism, a tabernacle is a cupboard or boxlike receptacle for the exclusive reservation of the blessed Sacrament—the bread and wine used during the rite of Holy Communion. In the Early Christian times such tabernacles were kept within private houses where Christians met for church, for fear of possible persecution. The Tabernacle is also seen in some Christian circles as representing Jesus Christ. The Temple of Jerusalem: patterned after the tabernacle, or vice versa? Critical scholars tend to see the biblical description of the Tabernacle as anachronistic. In this view, the primitive "tent of meeting" of Exodus 33 may harken back to an authentic tradition in which certain early Hebrews indeed carried a portable sanctuary with them on their journeys. However, modern scholars tend to doubt the historicity of a massive Exodus with 600,000 men and their families spending 40 years in the Sinai area without leaving any discernible evidence of massive human habitation. Indeed, the biblical description of the carpentry, foundations, and impressive gold, silver, and richly woven fabric ornaments of the Tabernacle make it nearly inconceivable that archaeologists should not have found substantial amounts of Israelite pottery, weapons, burials, or other evidence of human life and death in this area, if the story of the Tabernacle as written were true. Those ascribing to the Documentary Hypothesis see the biblical descriptions of the Tabernacle as originating largely from the "P," or priestly, source of the Pentateuch. Such descriptions, in this theory, project the pattern of the Temple of Jerusalem backward into history to show the temple's ancient and divine origins in the time of Moses. 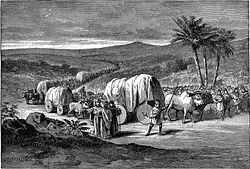 Many scholars today believe that the people who later became know as the Israelites did not truly migrate en masse from Egypt. Rather, many of them were parts of tribes already living in and around Canaan who later came to join the Israelite federation and adopt the story of the Exodus in much the same way that Americans celebrate their "origins" in the story of the Pilgrim Fathers landing at Plymouth Rock. Thus, the Tabernacle at Shiloh gradually grew in importance as it competed with other ancient shines at Bethel, Gilgal, Beersheba, and other locations. Eventually the Temple of Jerusalem adopted Shiloh's origin myth and simultaneously projected its own glory backward into Israelite history. Simple Guide to the Tabernacle – www.watton.org. The offerings of the Tabernacle – www.watton.org. Jewish Encyclopedia article – www.jewishencyclopedia.com. This page was last modified on 22 March 2019, at 19:03.